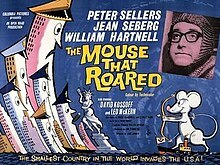 The Mouse That Roared is a 1959 British satirical Eastman Color comedy film based on Leonard Wibberley's novel The Mouse That Roared (1955). It stars Peter Sellers in three roles: Duchess Gloriana XII; Count Rupert Mountjoy, the Prime Minister; and Tully Bascomb, the military leader; and co-stars Jean Seberg. The film was directed by Jack Arnold, and the screenplay was written by Roger MacDougall and Stanley Mann. The minuscule European Duchy of Grand Fenwick is bankrupted when an American company comes up with a cheaper imitation of Fenwick's sole export, its fabled Pinot Grand Fenwick wine. Crafty Prime Minister, Count Mountjoy (Peter Sellers), devises a plan: Grand Fenwick will declare war on the United States, then surrender, taking advantage of American largesse toward its defeated enemies to rebuild the defeated nation's economy. Grand Duchess Gloriana (also Sellers) is hesitant but agrees to the plan. Mild-mannered game warden Tully Bascomb (also Sellers) is charged as Field Marshal to lead the Fenwick troops, aided by Sergeant Will Buckley (William Hartnell). The contingent of 20 soldiers in medieval chain mail books passage across the Atlantic on a small merchant ship, arriving in New York Harbor during an air-raid drill that leaves the city deserted and undefended. They chance upon a civil defence truck and are mistaken for invading Martians, prompting an investigation by blustering but ineffectual General Snippet (MacDonald Parke). Puncturing the tyres of the general's jeep with their bows and arrows, the Fenwick troops take him and four NYPD officers hostage. Still looking for a place to surrender, Tully and Will stumble across Dr. Alfred Kokintz (David Kossoff), whose invention of the Q Bomb – capable of destroying an entire continent – has prompted the defense drills. He has built a football-sized prototype of the unstable bomb, which Tully takes possession of. With Kokintz and his attractive daughter Helen (Jean Seberg) as additional hostages, Tully declares victory and returns with them to Grand Fenwick. The duchess indulges Tully's victory, and the prime minister resigns in disgust at Tully's blunder, leaving him as acting prime minister. When the incident is discovered, the U.S. government is thwarted from retaking the weapon and hostages by force, fearing the dishonor of attacking such a small and defenseless nation. Instead, they send the U.S. Secretary of Defense (Austin Willis) to discuss terms of surrender and get back the bomb. Meanwhile, Grand Fenwick receives competing offers of defensive aid from each of the world's powers, in exchange for the weapon. Tully becomes smitten with Helen, who initially despises him for taking them but falls for his simple charm. Then Snippet and Mountjoy conspire to steal the bomb and return it (and Helen) to America, but Tully gives chase and retrieves it. The Secretary of Defense and Tully agree to terms: the knock-off wine will be taken off the market, Grand Fenwick will receive monetary aid from the US, Helen and her father will remain in Grand Fenwick, and so will the bomb: held by "the little countries of the world" as a weapon of last resort if the superpowers refuse to disarm. Checking the bomb for damage, Tully, Helen, and Dr. Kokintz find it was "a dud" all along, and leave it in the dungeon, conspiring to keep its impotence secret. However, after they leave, a mouse emerges from it, and it appears to rearm, sitting ready to explode if disturbed. Stage rights to the book were bought in 1955 by Howard Dietz. Walter Shenson was doing publicity for Abandon Ship! (1956) in England in 1956 when given a copy of the novel by that film's star Tyrone Power. Shenson optioned the film rights in 1957 as his first independent production. He spent over a year trying to raise finance. He eventually obtained interest from Carl Foreman who had an arrangement to produce films for Columbia through his Highroad Films. Liberties were taken in the film adaptation to display Peter Sellers' versatile comedy talents. The lead character of the book is the Duchess Gloriana XII, an attractive young royal in the manner of the young Queen Elizabeth II and Princess Grace of Monaco. In the film version, however, Peter Sellers plays the role as a parody of an elderly Queen Victoria (who thinks the President of the United States is Calvin Coolidge), whilst his Mountjoy is a parody of Benjamin Disraeli. The Marseille and New York Harbor sequences were filmed in Southampton; the presence of the RMS Queen Elizabeth ocean liner there was a lucky coincidence. In addition, in the novel, an encounter with the New York Police Department leads to bloodshed that complicates peace negotiations; this does not appear in the film. Additionally, in the film, both Tully and Helen are with Dr. Kokintz when he discovers the bomb is a dud, and it is Tully who suggests that they keep that fact a secret; in the book Dr. Kokintz discovers the fact alone and apparently keeps it to himself. The lead role went to Peter Sellers. The female lead went to Jean Seberg, who was then under contract to Columbia. Title designer Maurice Binder added a mouse in an opening joke with the Columbia Pictures logo. One scene has diplomats playing a board game called Diplomacy, although the game more resembles Monopoly rather than the game Diplomacy. The film was a surprise hit at the US box office. The Los Angeles Times said the film "laid an egg". In 1964, Jack Arnold obtained exclusive television rights for The Mouse That Roared from Leonard Wibberley. He produced and directed a colour television pilot with ABC Television and Screen Gems called The Mouse That Roared, starring Sid Caesar as the Duchess, Mountjoy, and Tully, and co-starring Joyce Jameson, Sigrid Valdis, and Richard Deacon. However, the pilot was not picked up for production. It was filmed by Richard H. Kline. Richard Lester directed a film sequel, The Mouse on the Moon (1963), adapted from Wibberley's 1962 novel The Mouse on the Moon. ^ "Trivia - The Mouse That Roared". Turner Classic Movies. ^ "Rental Potentials of 1960". Variety. 4 January 1961. p. 47. Please note figures are rentals as opposed to total gross. ^ "The Mouse That Roared (1959)". ^ Reemes, Dana M. (1988). Directed by Jack Arnold. McFarland. p. 140. ^ "Richard H. Kline". Cinematographers.nl. Retrieved 18 June 2015. This page was last edited on 3 March 2019, at 11:46 (UTC).